7 1. 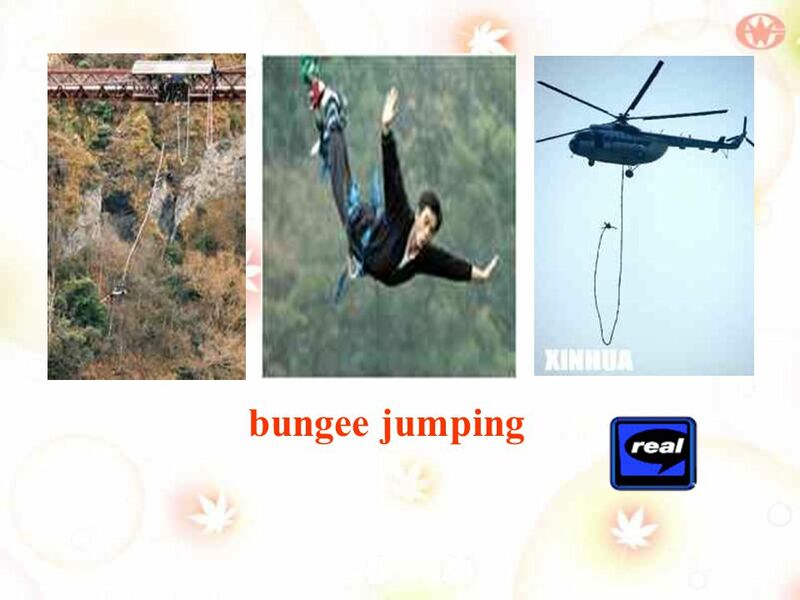 People do extreme sports in order to feel ____. 8 3. 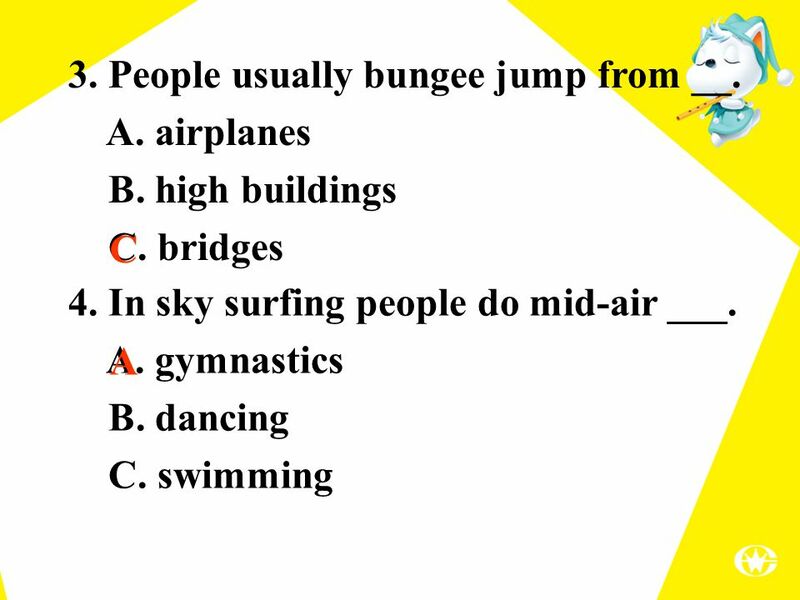 People usually bungee jump from __. 10 7. 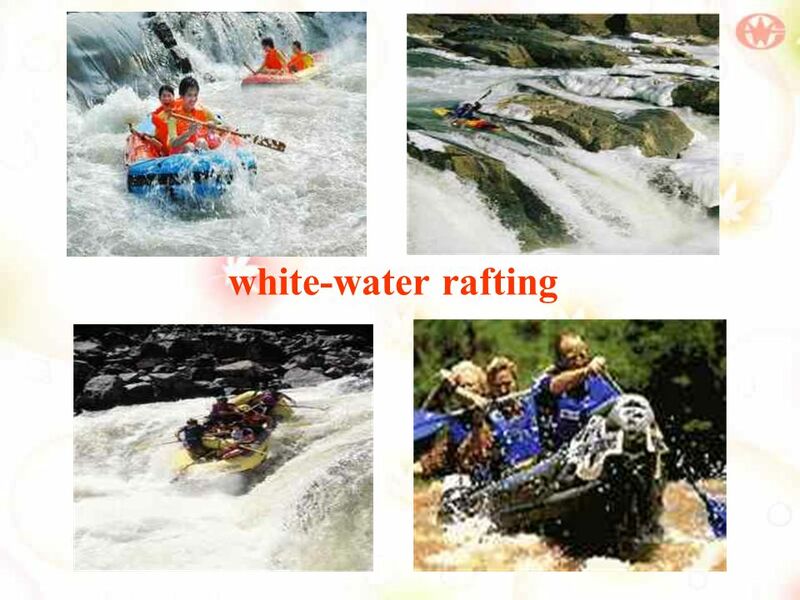 For white-water rafting you need __. 11 Listen to two people talking about extreme sports. Complete the table. 12 Listen and fill in the blank. 14 5. I love sports where there’s speed. I can’t _______________. 15 Listen again. 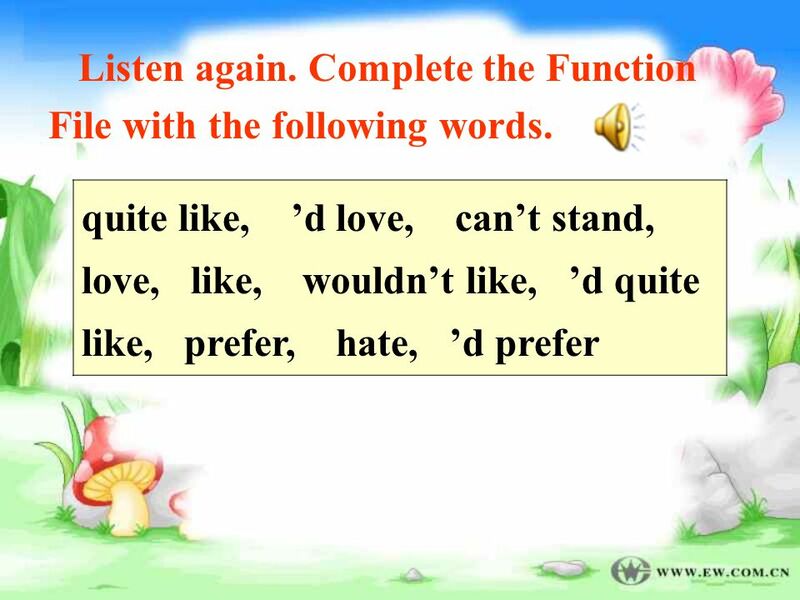 Complete the Function File with the following words. 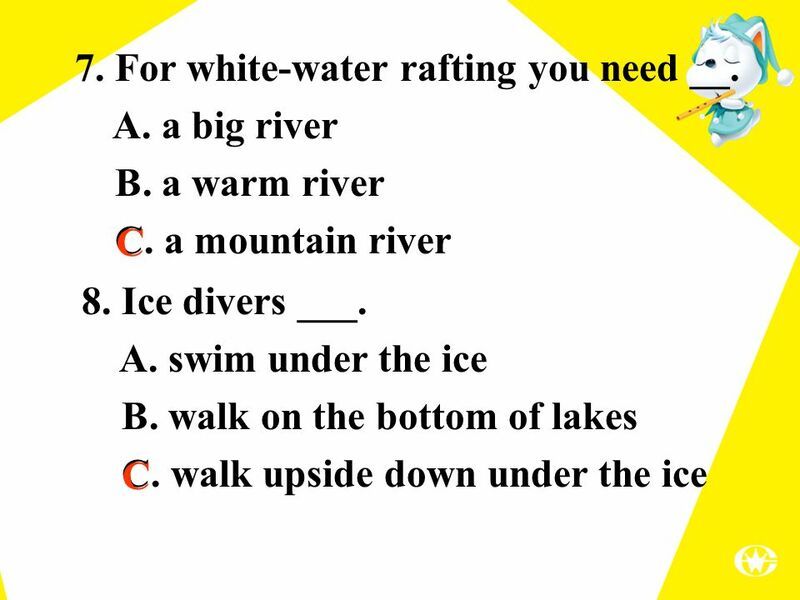 18 Complete the sentences in the correct form. 19 2. What kind of music ___ you ____? Listen to the questions below. In which of them does the intonation go up at the end? 1. What sports do you like doing? 2. 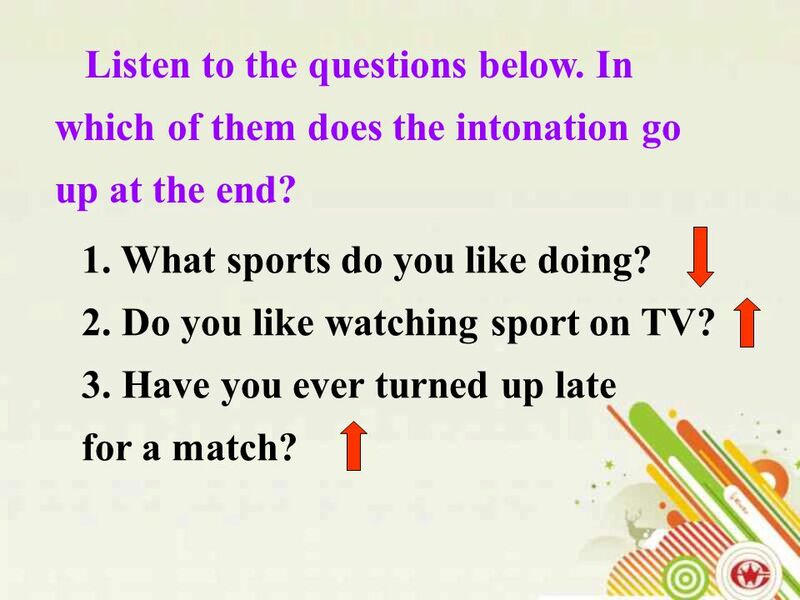 Do you like watching sport on TV? 3. Have you ever turned up late for a match? 21 4. 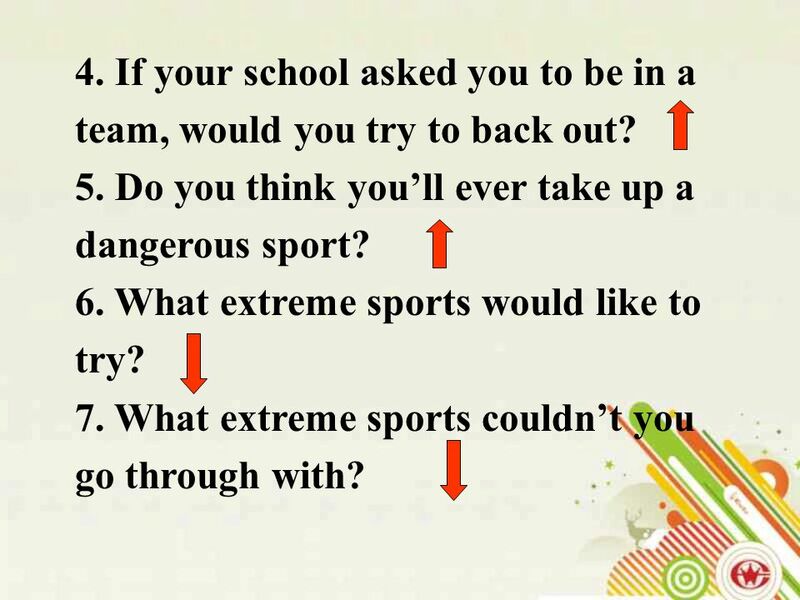 If your school asked you to be in a team, would you try to back out? 5. 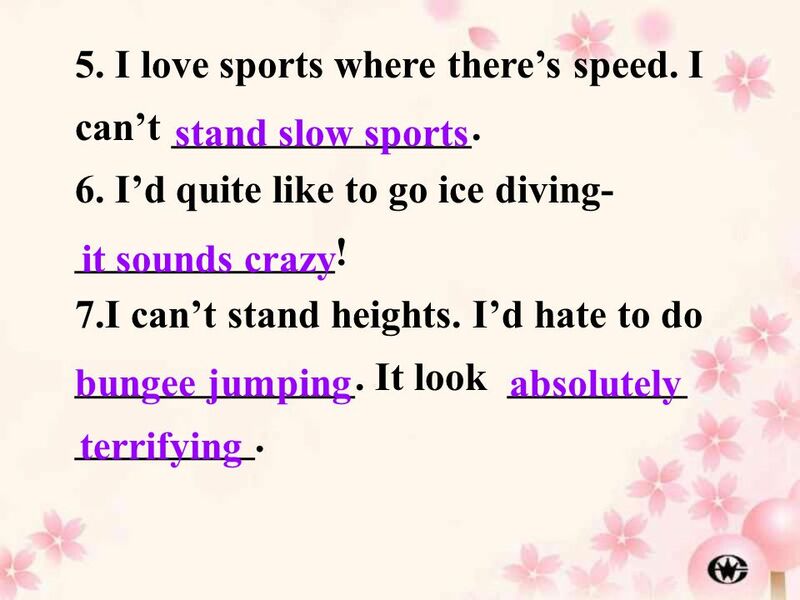 Do you think you’ll ever take up a dangerous sport? 6. 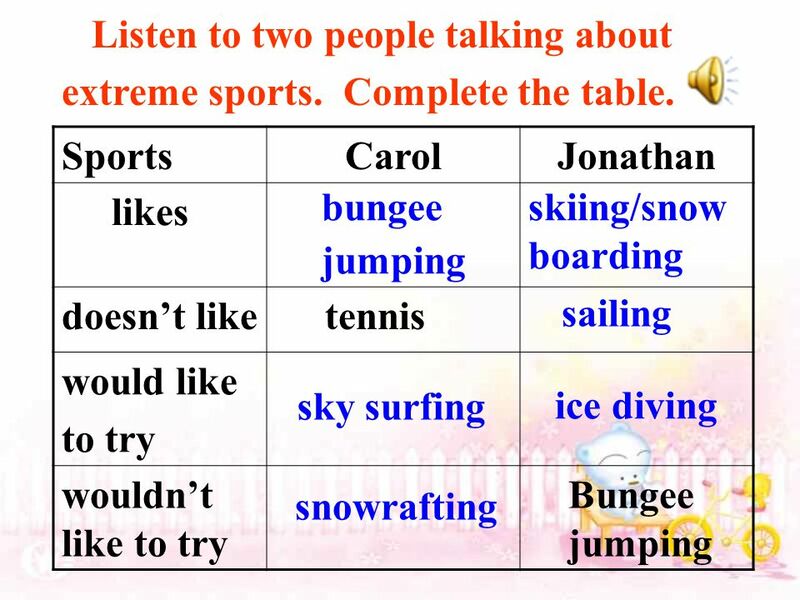 What extreme sports would like to try? 7. What extreme sports couldn’t you go through with? 22 8. Have you ever watched extreme sports on TV? 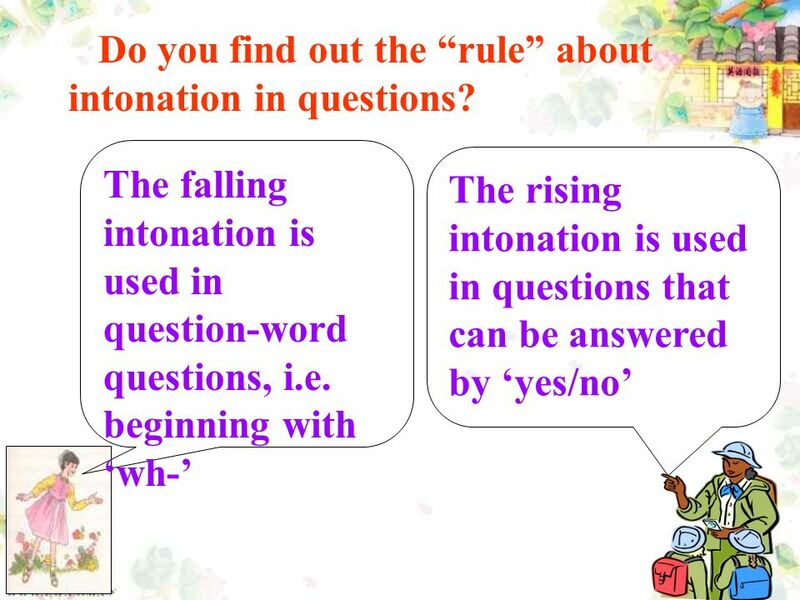 23 Do you find out the “rule” about intonation in questions? 25 1. What do American footballs have to wear? Why? They have to wear helmets and special protective clothes because it is a very physical game and they could get hurt. 26 2. How many baseball leagues are there in the USA? Two. 3. Are basketball players well paid? Yes. 4. 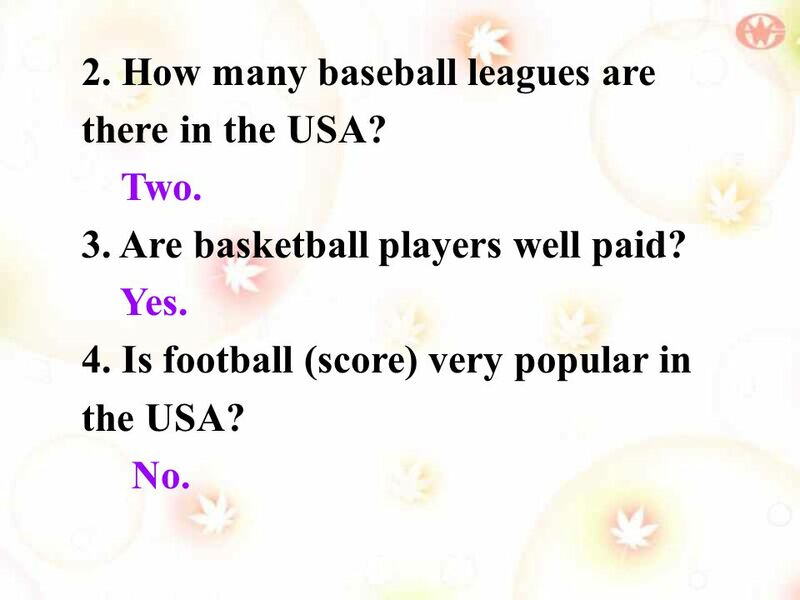 Is football (score) very popular in the USA? No. 27 5. 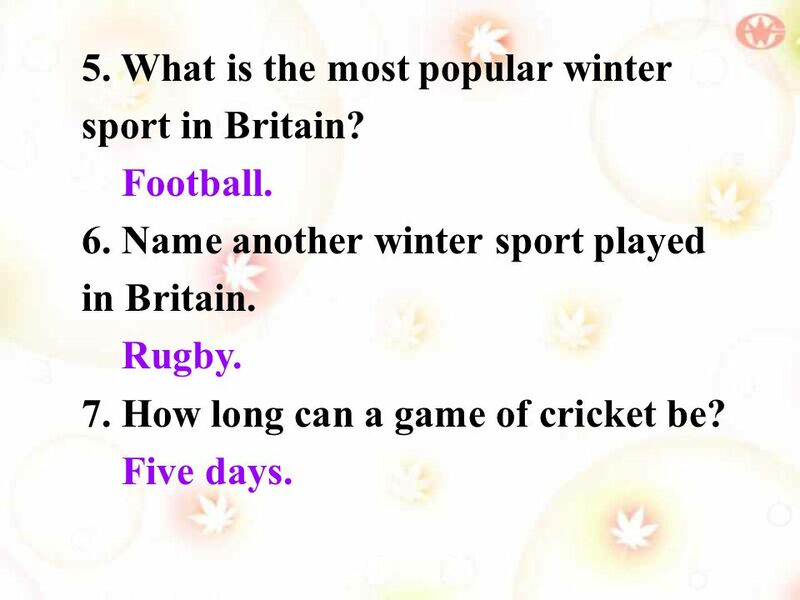 What is the most popular winter sport in Britain? Football. 6. Name another winter sport played in Britain. Rugby. 7. How long can a game of cricket be? Five days. 28 Are any of these sports popular in China? 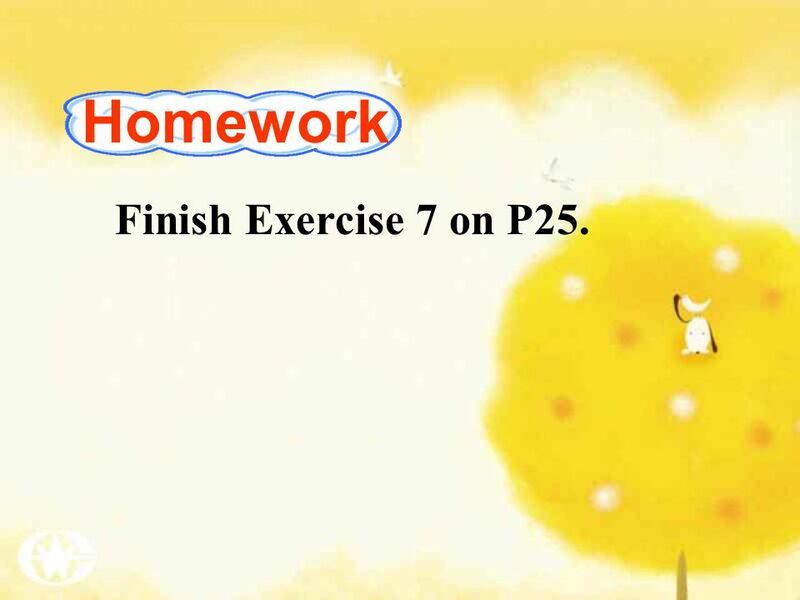 29 Homework Finish Exercise 7 on P25. 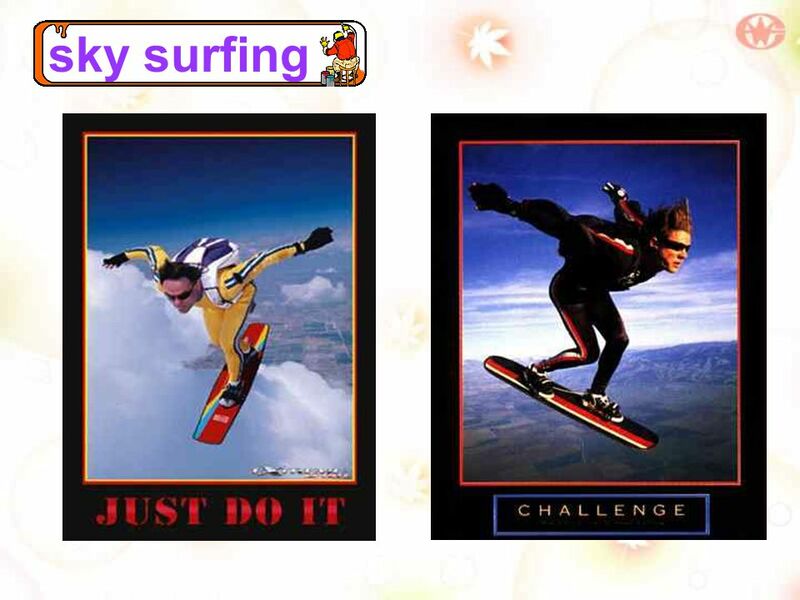 Download ppt "Lesson 2 Extreme Sports." 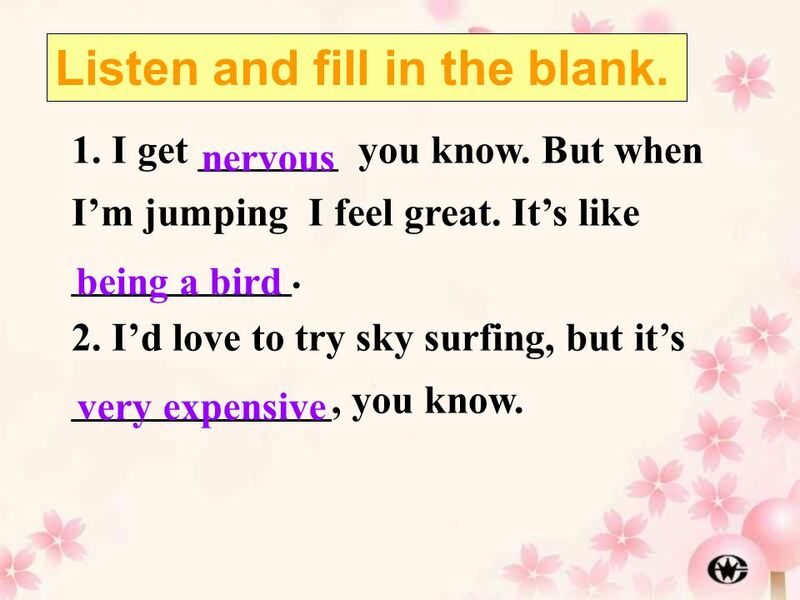 Advance with English 牛津高中英语 (模块一 ·高一上学期). 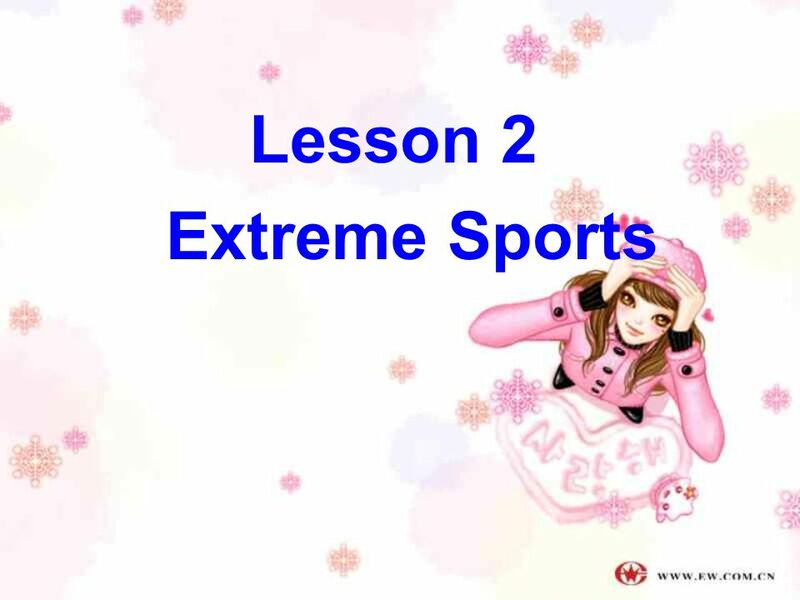 Unit 1 X-sport About X-sport I Content and Time Allotment Unit One X__sports The first period About X__sports II Objective: Students will be able to. Sport. Which sport? n Some matches can last for 5 days. n The most popular sport in the world. The most important game of the year is called the Super. PHYSICAL EDUCATION and SPORT in Framwellgate Moor Primary School. 1 Free Time / Leisure Unit FREE TIME/ LIESURE -SPORT ATHLETIC JOGGING TENNIS BADMINTON GOLF SKIING CRICKET SWIMMING RUGBY FOOTBALL. 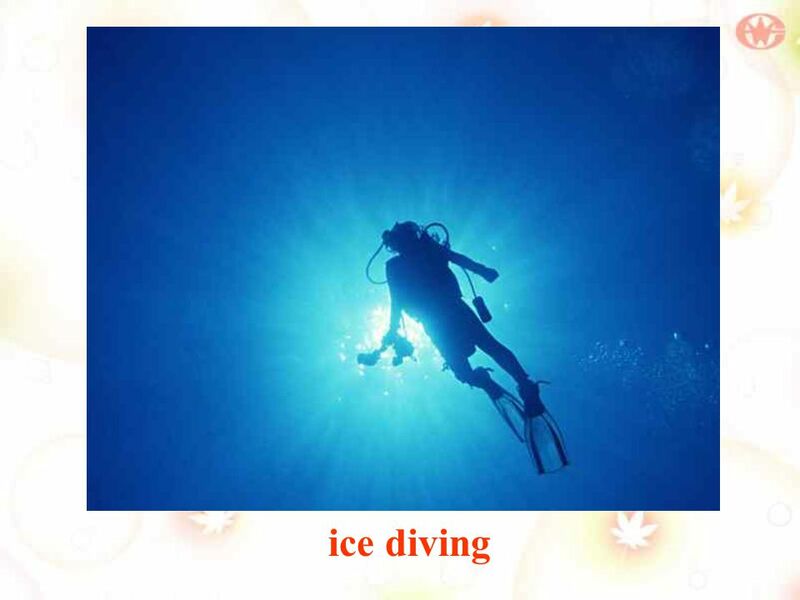 Extreme sports bungee jumping great really exciting nervous terrifying sky surfing very experience Snowrafting very expensive ice diving fast crazy sailing. Too and enough. Both too and enough are used to talk about how much or how little of something there is. Step one Warm-up. 2.Free talk Unit 6 What’s Anne doing? 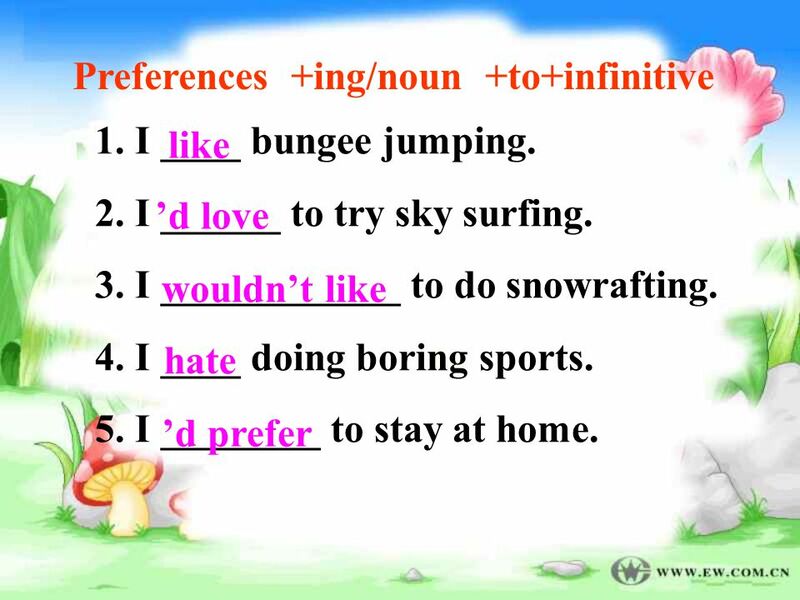 M ULTI - PART VERBS / P HRASAL VERBS Aims: 1. To learn what a multi-part verb is 2. 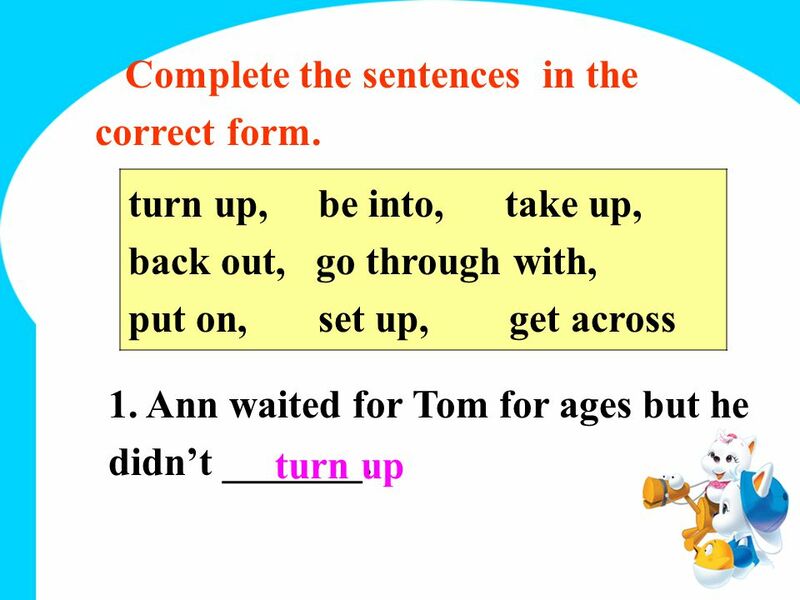 To learn some new multi-part verbs (take up, be into, turn up, back. Tag Questions Марванова Елена Раисовна учитель английского языка ГБОУ № 1455 г.Москвы It’s a tag question, isn’t it ? Yes, it is. PRESENT SIMPLE. Hi! My name’s Tom. I’m thirteen years old. I’m from Manchester, in England. I study 2nd year of secondary school. I don’t like school. Do you like ……? Yes, I do. / No, I don’t. I think it’s ……..
©Markéta Čeřovská, Lenka Lexová Sports and keeping fit. Урок в 7 классе За підручником О.Карпюк. Учитель англiйськоi мови Ерошкiна Н.I. What Sports or games are you interested in? Do you sometimes play basketball or football in the playground? How many boys are playing? Where are. Unit 1 Nothing is more enjoyable than playing tennis.